We really loved our recent trip to Stockholm. A city I knew very little about, but was so enticed by its aesthetic, and way of living. We walked about 10 miles a day and saw as much as we could in our 5 day visit. I'd love to see this place in the summer with everyone kayaking and swimming. We decided to go there because the Printmaking Society of Sweden was putting on a show there of artists from all over Europe. I will not mention the name of the show, mostly because of how disappointed we were with it. Thank goodness it was at the end of the trip and we had already seen so many wonderful things before it. Below are some amazing things we found on our trip, and at some point this month I'll post a printable, fold-up, illustrated map for you to bring with! We stayed in a great neighborhood called Södermalm. Everyone says the neighborhood is the "Brooklyn of Stockholm," which to me is always funny having lived in Brooklyn for 8 years... it is not. But what they mean is, it's young, fun and has lots of bars + shops. Our airbnb was so great, inexpensive, and clean! There are so many in this neighborhood, you cannot go wrong. We were able to visit both locations of this delicious spot. Our favorite by far was the smaller of the two in our neighborhood Södermalm. The service alone was worth the visit, such a friendly staff that looked like they genuinely enjoyed working there. The coffee was amazing, the bloody mary is the best I've ever had, and the food! Rollie got this toast stack of haloumi, roasted peppers, and some type of salsa with a poached egg. There was serious order envy going on, but my sunny-side up egg over mashed potatoes was more than fine! This vietnamese spot was our first stop off. We had amazing steamed buns - the sunchoke one was out of this world. We also tried their beef tartar with truffle (real truffle)... which was amazing as well. A must! Best dinner we had on our trip. The restaurant is in Södermalm. I had the fish stew, and I am still thinking about it! The food and wine list are out of this world. It's also so cozy - totally packed so make a reservation! Second best dinner we had for sure! The atmosphere was great and very busy. It did seem like it was a well known place among tourists, but it did not feel like a tourist trap or anything - the food was superb. We shared the fresh fish plate of chef pics for 2. It included lobster, prawns, 3 grilled fish, and scallops. It was delicious! Normally you go up to the counter and pick your fish and the chef grills it up for you. We found this hidden treasure half way into our trip. It's an amazing butcher/deli owned by two brothers who both can be found there every day! We got the steak sandwich and the sausage with homemade slaw. AMAZING. This was my all-time favorite find - a public garden that had a cafe, plant shop and boutique in these amazing greenhouses. They have a main table with all their different prepared foods and deserts. After we had some amazing tea and treats here for an hour or so, we went outside and saw the most amazing rainbow! Truly a magical place! Great deli for a quick sandwich/soup. They had a kale soup there that was out of this world. We stopped in here on a colder day and had amazing homemade sausage, and a pulled pork sandwich with some great local beers. It's in Gamla Stan, which is the most touristy area, but worth walking through and stopping in here if you're cold and hungry! This rum bar made me want to learn more about rum, as it had one of the largest collections of rum I've ever seen. The bartender was one of the friendliest guys we met on our trip too. We found out about this place a couple of days into arriving, and we sent twice. I had a negroni with rum, and it almost converted me to become a strictly rum drinker! We only had drinks here but wish we had a dinner as well. The interior space was so breathtaking, I could just imagine how busy it must be in the summer. This cocktail bar in Vasastan was something we found out about once we got there. It's tiny and I would definitely eat there if we hadn't gone so early. Everything from the way it's decorated, to the way the bartender is dressed, to the glassware the amazing drinks are served in, is completely authentic speak easy vibe. I read that they have live jazz there sometimes, but I don't know where the jazz band fits! Either way, if you're a cocktail snob...go here! This cocktail bar is so cozy and they are actually the reason we found Paradiso. Great drinks! The bartender let us try a really rare japanese whisky one night. We could not get over how nice everyone was! Some of the most stunning murals I've ever seen! Mostly on the Blue line but on the red as well. We saw the Cooper & Grofer exhibit here and were BLOWN AWAY. No matter what the exhibit is, the museum is so gorgeously designed, and the lighting on each photo is so well done. They also have a bar and restaurant in the museum that was beautiful and overlooks an amazing view of the city. It's also opened until 11pm! Such a great idea for after or before dinner. This maritime museum was pretty amazing. To see a ship that size, from 1628!!! There's really no way to describe this experience. This sculpture garden is such a great place for a sunny day. Just a short subway and then bus ride out of the city, it's worth the hike. I can only imagine how beautiful it must be in the spring/summer with all the fountains and gardens in full bloom. The cafe here was so delicious, and seemed to be more popular than the gardens! This cemetery, a short subway ride out of the center, is a must see. It also has Greta Garbo's tombstone! The nature alone here is worth seeing. To think of walking in a procession amongst this nature, for someone you love - it would make anyone at ease. 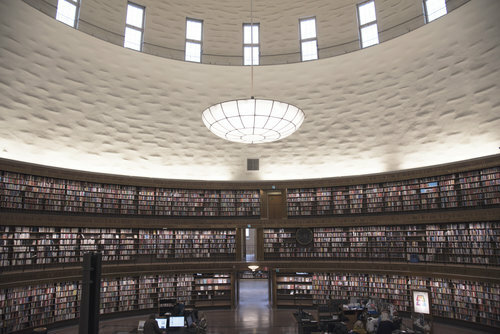 Stockholm Public Library: This curved room is quite amazing to see! Love seeing beautiful libraries like this in full use - it was packed! Grandpa: This lifestyle store was superb - in Sodermalm as well. Beautiful clothing for men and women, and amazingly designed interiors products as well. You could spend a lot in that store if you felt like it! Acne Archive: In Vasastan, if you love the Acne 90s style-vibe, it's worth peeking your head into. I would have loved this jean jacket lined with shearling.